I think I have found the creme de la creme of the vintage recipes. How can I ever find one to top this one in both repulsivesness and straight out scariness? 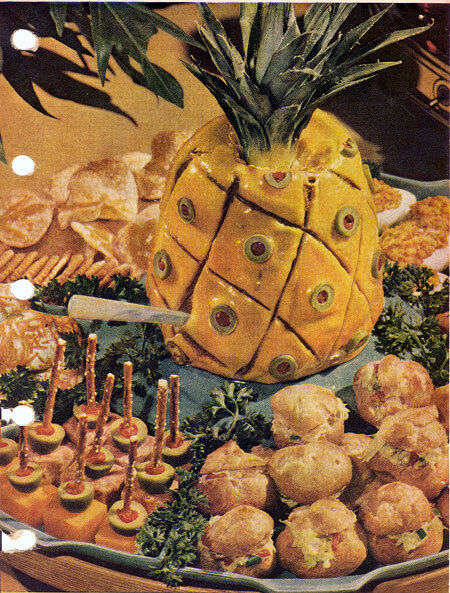 The centerpiece of this lovely appetizer spread in my 1953 Better Homes and Gardens Cookbook is a Liver Sausage Pineapple. Yes, it is one pound of liver sausage with lemon juice, worcestershire sauce and mayonnaise shaped like a pineapple. The lovely yellow coating on the outside is made out of unflavored gelatin and mayonnaise. You “frost it” with the jello mayo, score it, and stick little olive slices all over it. The recipe says to top “with a real pineapple top for fun!” They also helpfully mention that you should serve hot coffee with this whole spread! Nothing goes better with liver sausage and deviled eggs than a boiling cup of hot coffee! Mmmm mmmm! Frankly, I am speechless with this one. I guess since it is 1953 and Hawaii statehood was a hot topic, maybe this is a special way of honoring the territory (and maybe tipped the scales to accept statehood?) All I know is this has to taste like a can of Alpo with olive bits. Maybe if you grilled it….? I LOVE this! It is so disgusting it is perfect! buwahahahaha…… you can’t make me! I’m completely speechless with disgust. I keep wondering how much I would have to be paid to eat that. i have this recipe. Apparently in the 50″s there was a surplus of liverwurst and canned fish so the folks at Better Homes and Gardens had to find something to do with it. Pingback: “21 Truly Upsetting Vintage Recipes” ~ You Find the Most Unusual Articles on the Internet! | Mmm, Taste This! Pingback: 21 TRULY disgusting vintage recipes! Have you tried Candle Salad? Try Candle Salad – from the same vintage. Even more strange. Posted	 July 8, 2015 at 6:26 pm by Mike J.
I made this exact thing for a Halloween party about 5 years ago and it was an absolute hit. Not only did it look weird, but it got devoured. I even garnished it with crackers and limburger cheese.